Whether it’s a short walk in a parking lot or a long trek to work—we’re all pedestrians. When people share spaces with 2-ton steel machines, it’s important that we all watch out for each other. Wear bright or reflective materials. Carry a light when walking in dark conditions (including dusk and dawn). When crossing a street, remove distractions which may make it hard for you to see or hear an approaching car (such as headphones or cell phones). Listen for the sounds of engines and look for backup lights on vehicles, especially in parking lots. Always look left, right, and left again before crossing a street. Do not assume that cars will yield to you, even with a crossing signal in a designated crosswalk. Make eye contact with drivers before crossing. 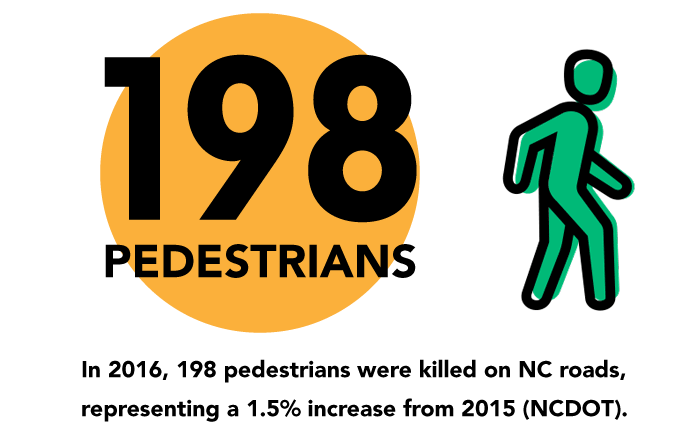 We all have a part to play in ensuring that North Carolina’s vibrant communities have safe streets. 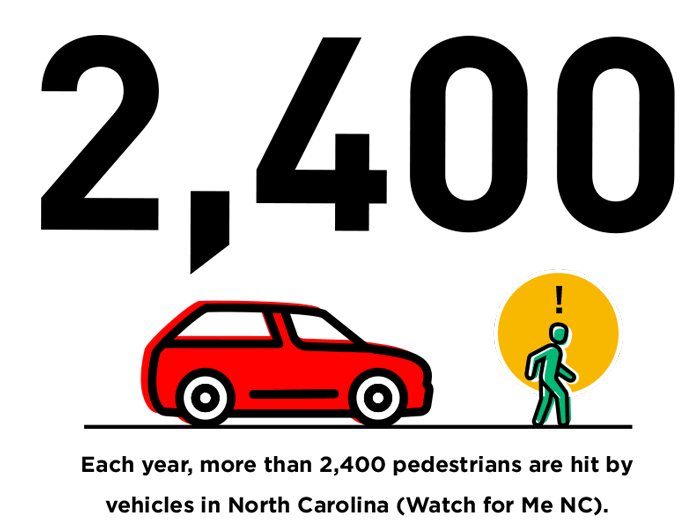 Watch for Me NC is the North Carolina bicycle and pedestrian safety campaign. Over 25 areas in North Carolina participate in the program. Teaching your child to be a safe pedestrian. It can be hard for kids to judge speed and distance until the age of 10, so it is important that parents, caregivers, and teachers provide consistent guidance and supervision to young children whenever they are in or around traffic. Reinforce that streets are off-limits without adult guidance. Practice walking up to the curb with your child and stopping before the road. To help your child understand the size of cars, have your small child stand next to a car for comparison. Teach your child to freeze or stop on your command (Make it fun – come up with an unusual “stop/freeze” word – like “popsicle”). Dress your child in bright clothing to make him or her more visible to cars. Practice crossing the street safely (looking left, right, left, holding hands with an adult, etc.). In parking lots, have your child touch your car until you give the “password” and are ready to hold hands and move. Have your child look for “clues” that a car is about to move (rear lights, sound of motor, exhaust smoke, etc.). No, not always. Drivers must yield to pedestrians in crosswalks – even if the crosswalk is not marked (WatchForMeNC). However, pedestrians are extremely vulnerable road users, and drivers should always be alert for anyone traveling on foot.